Yesterday was a pretty big day for Switchfoot. Here's a rundown of what went down! 1. Switchfoot plays a show prior to the BCS National Championship Game AND bring a Jonas Brother onstage - Joe Jonas to be exact. This blogger recaps what went down. Apparently, Joe sang "Dare You to Move" with the band. Nice. Switchfoot, the rock band the couple was watching, is from San Diego and had no favorites in the game but engaged the divided crowd. Between songs, the guitarist played riffs from Deep in the Heart of Texas and Sweet Home Alabama to cater to both sides. 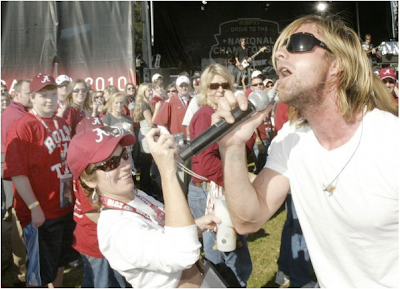 “Welcome to the sunshine,” said lead singer Jon Foreman. ^Class guys, them Switchfoot boys are. 2. 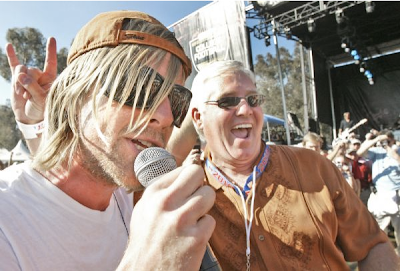 Switchfoot chats with fans through the LA station 987's live chat. - The "Always" video just wrapped up. It was created for Japan and they are very happy with how it turned out. It'll be released "very soon." - They are working on a new PODCAST. - Switchfoot will be touring across the world, including Japan and Europe. At the end of the first quarter of the game, a video montage of game highlights (to that point) were played, while the chorus of "The Sound" featured as the song playing in the background. There was also text crediting the song. A national audience saw the song and read who it was by! As a result, "The Sound" is now the top selling Switchfoot song on iTunes, and has cracked the top Alternative songs chart at No. 106. UPDATE (1:26 PM PST): "The Sound" is now no. 81! ^All in all, a HUGE day for Switchfoot. Atlantic Records is doing an astounding job right now, and this is an amazing way to kick off 2010! This is going to be a huge year for the band, and I hope you're just as stoked as I am to experience it! 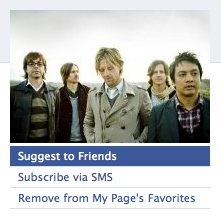 Mission: Suggest Switchfoot to all your Facebook friends! Almost at 3000 new fans since our campaign began back on Tuesday! If you haven't done your suggestions or don't know what we're talking about, be sure to check the official Switchfoot boards post! Another HUGELY important thing we need you all to work on, is to sign up for and fill out Ratethemusic.com's poll. Why this is important is that this is THE researching poll that radio stations across America look to when determining their playlists. "Mess of Me" is up for the ALTERNATIVE poll. So when you're first signing up, be sure to indicate that the "alternative" format is your favorite musical style (even if you don't really like it. That's the only way we can poll for "Mess of Me"). We need "Mess of Me" to "research" well on the alternative format, and here is where we can make the newly re-christened Footsoldiers' presence felt! 1. Sign up for an account on Ratethemusic.com. Be sure to indicate that your favorite music style is "Alternative"
2. There will be a list of songs that you flip through and rate on three scales: how familiar you are with the song, how much you like it, and whether or not you're tired of hearing it on the radio. 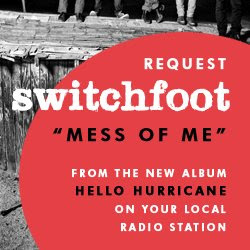 Once you reach "Mess of Me," be sure to say you are familiar with the song, love it, and are not tired of hearing it on the radio! 3. Be sure to fill out the regular poll, and the NEW Switchfoot Special Music Survey! As soon as you complete this mission, say so below! Here's another TWLOHA clip with Jon Foreman in it. And you know the drill on the rest of them! Request request request! Let's keep the ball rolling Footsoldiers!